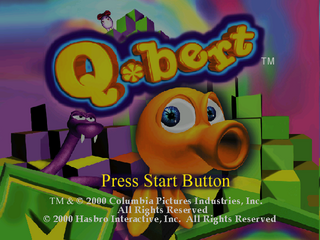 Q*bert is a 1999 PlayStation remake of Gottlieb's original 1982 arcade game of the same name, published by Hasbro Interactive (under the Atari brand) and developed by Artech Studios. In 2000, Majesco and subsidiary Pipe Dream Interactive brought the game to the Dreamcast, only in North America. The Dreamcast version plays much the same as the original, but is now presented in full 3D with updated graphics. The game features both a story-based Adventure mode with various types of levels and an Arcade mode that follows the same rules as the original game, as well as a playable version of the 1982 original. Main article: Q*bert (Dreamcast)/Magazine articles.